Be sure to register to see what SAM LPLP is all about and learn about the exciting changes made to the program! SAM LPLP provides a unique and innovative approach to professional learning for Montana school leaders by providing an opportunity for participants to receive student-focused, solution-based professional development designed to be responsive to the challenges and issues administrators face each day. Connecting new, experienced, and aspiring administrators throughout the state, LPLP’s multifaceted blended learning approach consists of a rich online resource center; collegial learning networks that allow participants to focus on specific topics of interest; and personal learning networks including the option of one-on-one coaching/mentoring with experienced Providers. 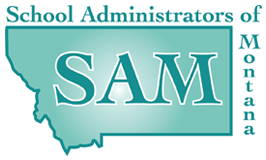 The SAM LPLP delivery system continues to inspire many educators and leaders to understand contemporary, research-based initiatives and successful educational leadership strategies to positively impact the education of thousands of students across Montana. Click HERE for more information about SAM LPLP! Click HERE to register for SAM LPLP 2018-19! In this engaging, relevant, & practical session, learn from childhood trauma expert Kristin Souers about the importance of trauma-informed practices in the school setting. Participants will be provided with opportunities to reflect on information centered around the role that trauma plays in the school environment; the importance of self-awareness & regulation & strategies to support these in the school setting; the power of relationships & the role they play in the establishment & maintenance of school safety; the importance of self-care & the need for the professionals to have tools & strategies to support their own health. This professional development experience is for teachers, administrators, school counselors, psychologists & community health professionals. It will emphasize a strength-based approach to use with students, families, fellow faculty, school personnel & community members. Click HERE for more information about MTASCD Summit! Click HERE for information about MTASCD! Check back for a more detailed agenda!